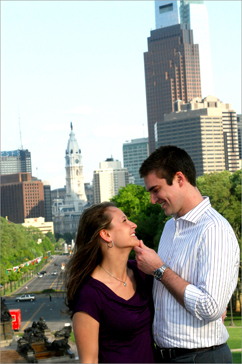 One of the major commercial, cultural, and architectural centers of the northeast, Philadelphia is a city ripe with scenic locations for your engagement photography session. Start off at Philadelphia’s famous JFK Plaza, also known as “LOVE Park.” This famous photography location faces Philadelphia City Hall and opens onto a view of Benjamin Franklin Parkway. Have your engagement photographer take photos of you and your fiancée with the plaza’s glimmering central fountain in the background. You can also take some seated photos on the plaza’s curved granite steps or on one of the benches encircling the fountain. The numerous towering skyscrapers that surround JFK Plaza will also provide a stunning backdrop for your engagement photos. And of course, no photo shoot at LOVE Park would be complete with a romantic portrait in front of the famous LOVE sculpture. Once you’ve finished at LOVE Park, take a short ride over to the imminent Pennsylvania Academy of the Fine Arts, located less than two miles away. As you peruse the exterior of the academy, your engagement photographer can capture candid snapshots of you and your fiancée, with the structure’s gorgeous Renaissance-Gothic architectural style providing the backdrop. Have your photographer arrange an intimate portrait of you and your loved one seated on granite steps at the building’s entrance. You can also pose beneath the ornate arched entrance, in front of the museum’s elegant wooden doors. Be aware that the PAFA is a very popular attraction year-round and make sure to plan accordingly. Your final stop on this itinerary will be the Benjamin Franklin Bridge, which crosses the Delaware River. As you and your fiancée pose for a portrait, you will enjoy a breathtaking panoramic view in all directions. Looking to the west and to the east, you will see the expansive urban cityscapes of Philadelphia and Camden, New Jersey. Meanwhile, you will be embraced from the north and south by the azure Delaware River, making a beautiful setting for your engagement photos. Besides containing one of the country’s most recognized urban cityscapes, Philadelphia also offers plenty of picturesque natural settings. 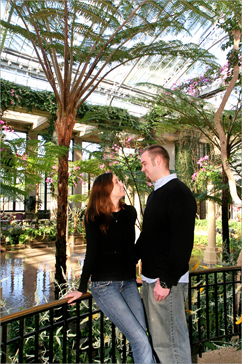 A favorite of Philadelphia locals and tourists alike, Longwood Gardens will provide the perfect location for your engagement photo shoot. Start off your excursion through this 1050-acre botanical garden at the Conservatory, which is divided into three separate complexes. The West Conservatory complex is home to number of different exhibits, including the vibrant Orchid House, the romantic Rose House, and the tranquil Water Lily Display. Visit the Main Conservatory for a chance to explore the fragrant Orangery and the Exhibition Hall, which looks as if it sits atop a reflective pond. Finally, the East Conservatory provides a Garden Path that you and your fiancée can meander along while your engagement photographer captures some candid moments. Even more impressive are Longwood’s expansive outdoor gardens. The Hillside Garden provides a network of paths to lead you through its floral treasures, as well as paved stone landings and granite stairs that will work great for relaxed photos. You and your fiancée can also visit the Oak Conifer Knoll, which is surrounded by several towering sequoia trees, as well as a variety of conifers. And no matter what, don’t miss out on the Chimes Tower and Waterfall (located in the Main Fountain Garden), where you can listen to regularly scheduled carillon concerts. Finally, don’t forget to check out Longwood’s unforgettable fountains. From the expansive Main Fountain Garden to the impeccably-landscaped Italian Water Garden, you and your fiancée will be amazed by the beauty and diversity of your sparkling surroundings. Philadelphia’s most famous and historic location is Independence Mall State Park, located minutes away from the downtown area. This 45-acre contains many gorgeous sites that will work perfectly for your engagement photos. Please note that due to the park's popularity, a permit is required for photography at Indy Park. You can get the permit here. Have your engagement photographer arrange a portrait of you and your fiancée beside the entrance of the charming Colonial-style Independence Hall. The impressive Beaux-Arts architecture of Memorial Hall will also create a great setting for your photo shoot. You and your fiancée can relax on the front steps or even enjoy the lush greenery in the foreground of the building. Just a short distance away you’ll find the First Bank of the United States. Here you and your loved one can pose for a romantic portrait in front of the arched entrance or beside one of the building’s towering Greek columns. Finally, have your engagement photographer snap some photos at the Merchants’ Exchange Building. You and your fiancée can pose along the exterior staircase on either side of the building or simply take some informal photos strolling through the courtyard with the opulent Greek Revival architecture looming in the background. You’ll never forget your excursion through beautiful and historic Independence Mall State Park! If you didn't get a permit for Indy Park, you can take a scenic walk around the Society Hill neighborhood, just south of the park, or around Olde City, just a few block east. Elfreth's Alley is another charming place for pictures. Love Park - yes, the one that has the famous LOVE sculpture - is a popular photo destination, and if you're quick you might be able to get some permit-less snaps. If you plan to stay for a longer stroll in Love Park, get the permit here.